Having played at Wembley and featured in English Premier League matchday squads, it’s fair to say that in Marc Laird, Edinburgh City have signed a player with more pedigree than most in League Two. The Edinburgh-born Man City academy graduate has penned a short-term deal with the Lowland League champions until January 1 having left Yeovil Town in the summer, and made his debut in the weekend’s 1-1 draw away to Annan. Along with Craig Beattie, City arguably have the two players with the most impressive CVs in the division among their ranks. At 30, Laird has designs on continuing his career at a higher level, and is honest enough to admit that his stint at Meadowbank is a chance to put himself in the shop window north of the border. He by no means sees it as a one-way street however, and hopes the arrangement can be mutually beneficial to both parties. “It hopefully will give me the chance to raise my profile in Scotland,” said Laird. “I’ve been away for 15 years, playing in England since I was a young lad. “I’m really friendly with Man City’s chief scout in Scotland, John Ferguson, who said he’d try and get me something local for fitness while I was up here. I was still undecided about my football, whether anything would come up in England or abroad. He sent an email to Gary [Jardine] and he kindly said I could come along and use the facilities and made me feel really welcome. “He mentioned to me about maybe playing – I’ve never played in Scotland and felt the opportunity to come back at this stage in my career was something I’d like to have a go at. “Having that change of scenery and being back home with my family will do me good and I wanted to test myself in Scottish football and I’m hoping it can push me on again. The former St Augustine’s High School pupil is currently back and forth between Edinburgh and Manchester, although will be back in the capital permanently soon enough having sold his house. After spending half his adult life playing in England and sharing City squads with the likes of Joe Hart and a certain Joey Barton, there are of course one or two highlights that stand out. The surroundings now are a lot less salubrious, but Laird is confident the nature of the English lower leagues have made him well prepared for their Scottish equivalents. 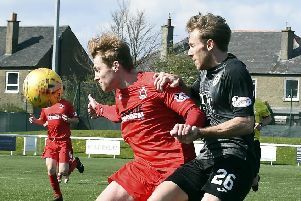 “The English leagues are physical and having watched Edinburgh City against Montrose, Scottish League Two is a lot about the second ball as well,” he explained. “You get teams that’ll play and teams that’ll be direct and get the ball in behind too, which Gary’s explained can happen a lot. “The standard of our squad is impressive, although they’ve not had the results to go with what they’ll want to achieve so far. They’re new to the division though and are learning as well – it’s a whole different situation now – that step up to the league football.